Isn’t it nice to live in a house that is surrounded by nature? It would be very relaxing if you see plants everywhere! Although we can actually add plants indoors, it is still better to have your very own garden or courtyard. When you have that, you have a natural environment that is refreshing and will help you de-stress. That is why many homeowners look for a way in order to include that in their home. Others would have a rooftop garden if they do not have enough space on the ground level. 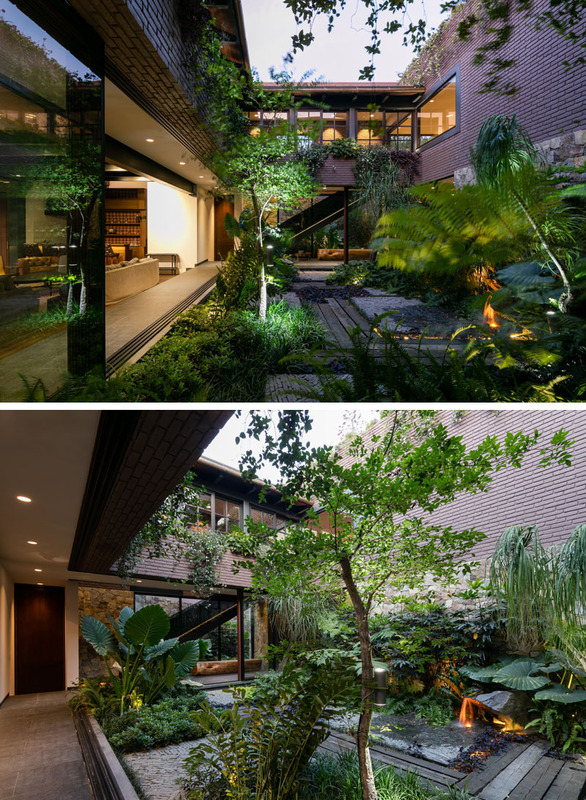 Still, others prefer to have a central courtyard while there are homes that have gardens all around it! Today, we are going to show you a home that is designed in a way that the owners could interact with nature. 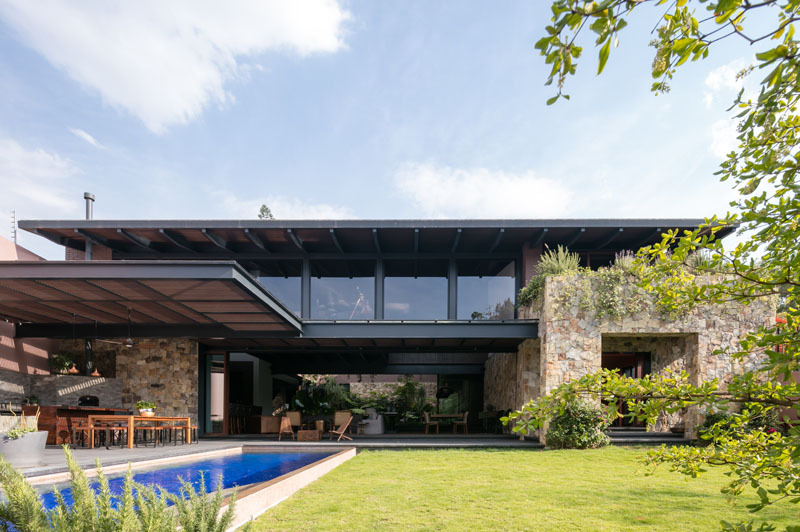 This is what you will see in Casa OM1 designed by Andrés Escobar of AE Arquitectos. 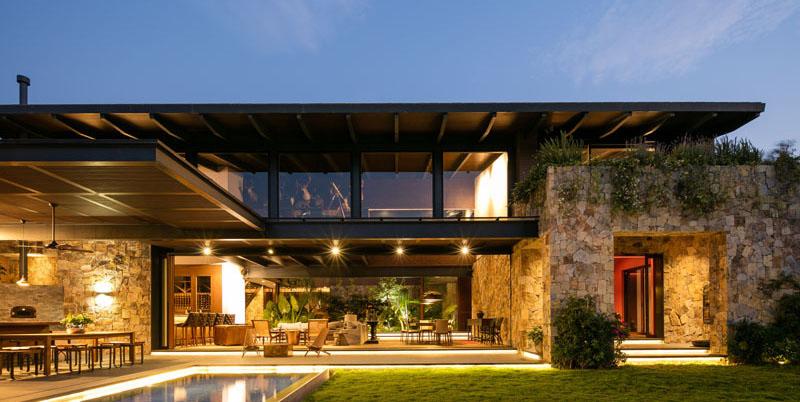 This contemporary house is located in Guadalajara, Mexico. Unique feature: A beautiful contemporary home which has gardens around it and a central garden. It allows the owners to interact with nature. 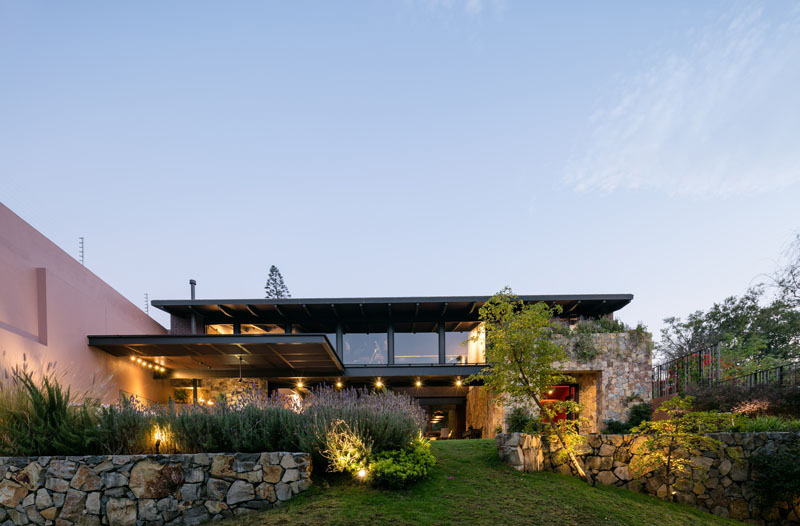 This contemporary home made use of wood, stone, and steel which results into a house with a natural appeal. You can see that the house has outdoor spaces like the dining area and kitchen that is located near the pool. Love the plants on the stone wall! At the rear of the home, the sloped backyard has a stone retaining wall filled with plants. The stones add beauty to the home’s exterior and it is also used in the interior as well. There is also grass that leads up to the house. Aside from the open spaces of the house, it also has a spacious lawn and outdoor area. It features an L-shaped pool with a dining and sitting area near it. 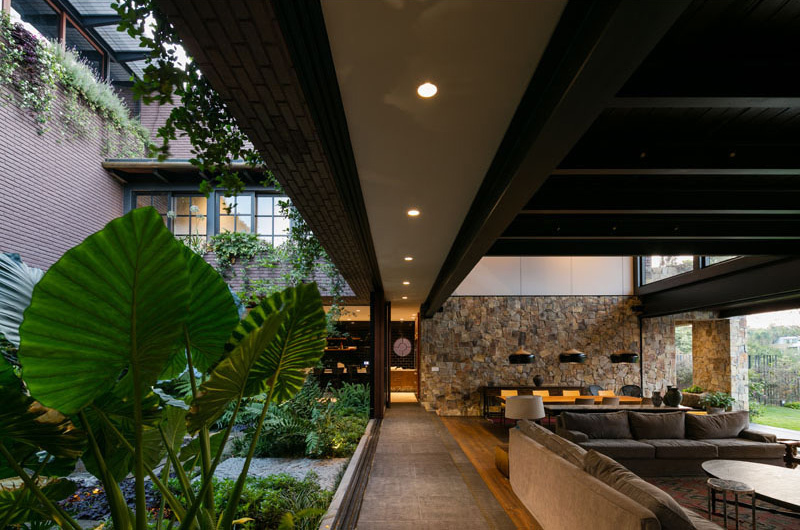 Next to the main living area is one of the home’s highlights- an internal courtyard which is filled with plants and a water feature. It is so Instagram-worthy indeed! I would love to have this space in my own house! 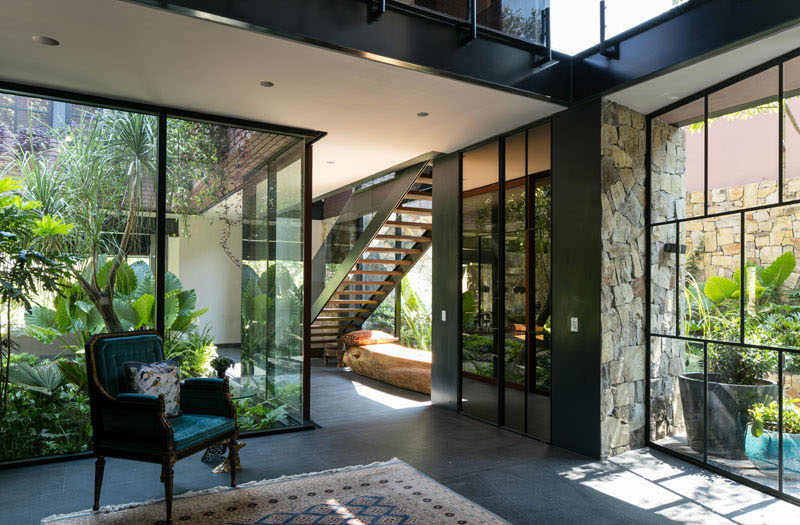 Inside the house, there’s a glass wall that shows off the courtyard from the hallway. It would be nice to sit here and read a book with a good view of the garden. Inside, the living room, dining room and kitchen all share the same space as seen in the image above. Both sides of the space open to green spaces while its high ceiling allows plenty of light in. 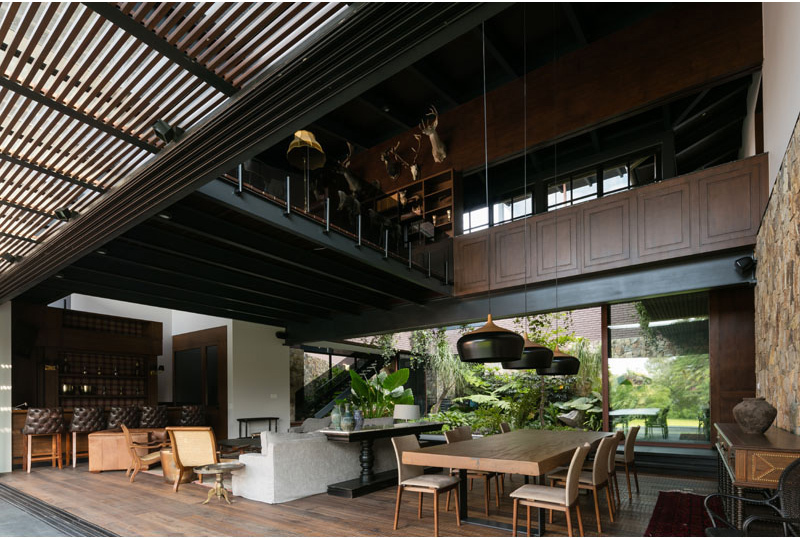 The use of wood and steel can be seen here which adds to the home’s natural appeal. 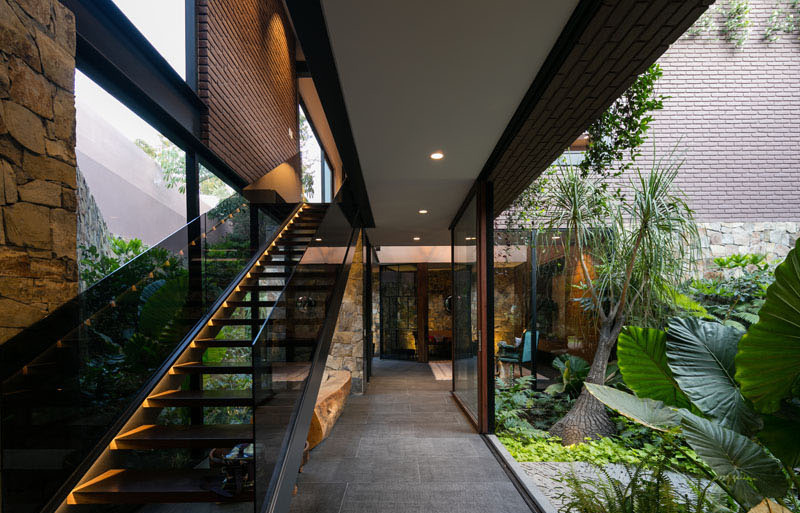 In the hallway and alongside the courtyard, you can see some wood, steel and glass stairs that lead to the upper floor of the home. And while you access the stairs, you will be gifted with a good view of the gardens. This house is really a beauty especially when all the lights are turned on. The lighting adds drama to the entire house. 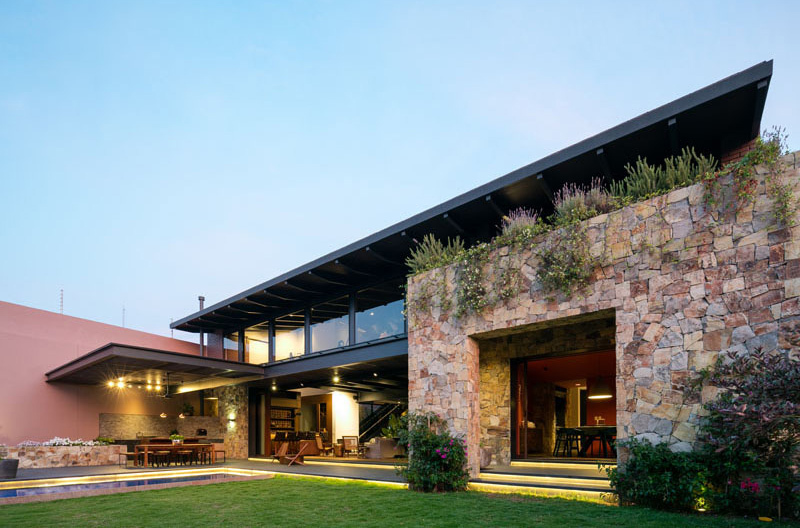 The effect of using stones bring a warm aura to this residence. This is indeed a beautiful home! 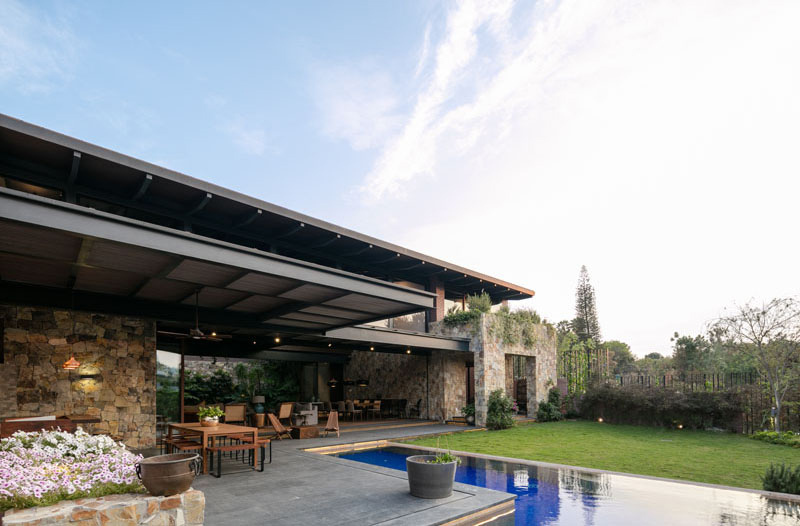 Like their other home designs, the Casa OM1 from AE Arquitectos never fails to deliver an impressive design that will satisfy the needs of the owners. What I like about this house is how it managed to integrate nature into it. You can notice that there are plants and flowers everywhere from the exterior to the interior. And I really like the idea of having a central garden which contains different types of plants. How about you, can you tell me what you like about this home?